Notes : The Saber class was part of Starfleets modernization programme of the 2340's. They were designed to be a frigate counterpart to the Steamrunner class starship; much smaller, easier to build and hence considerably more numerous. The designers brought in many measures to ensure that the Saber class would be easy to build; like the much earlier Oberth class science vessels the Saber's design is highly modular in nature, allowing ten thousand ton sections to be constructed in small shipyards before final assembly in a larger facility. One requirement was for the Saber's to have a science and exploration capacity equal to 85% that of a Steamrunner class along with equal cruise and maximum speeds - a measure intended to allow the vessels to work together in co-ordinated operations. This proved an exceptionally difficult target to meet in a hull with only two thirds of the volume of a Steamrunner; the designers were eventually forced to cut the torpedo armament of the Saber class from the original two triple-fire torpedo tubes to a single mono-fire tube and reduce the load carried from 90 to 30 torpedoes. The six type VII phaser arrays were at first to be reduced to only four, but in the event a reduction in the ships accommodation levels allowed a single Type VIII emitter to be worked into the leading edge of the saucer section. This brought the overall phaser power to some 91% of the initial planned phaser capacity. 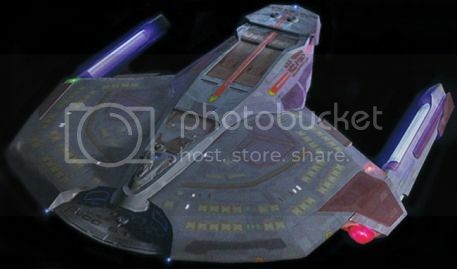 The competition for internal volume also forced a reduction in the size of the warp core, and as a result the Saber can only manage a top speed of Warp 9.2 compared to the Steamrunner's Warp 9.5. The original specifications of the Saber called for a crew of 130, but increased automation of the engineering systems allowed this to be cut to 118 and then 102. Conditions for the crew are quite poor by the standards of the Steamrunner or Akira classes; crew quarters average 30 square meters and there are no holodecks. In addition, there are no personal replicator stations in crew quarters - instead three mess areas are provided with replicator systems for the whole crew. The Saber's have proved reasonably successful in service, although the relatively poor living conditions has led to a shorter than expected average mission duration. Like the larger Akira and Steamrunner classes, Saber's have largely served in the frontier regions and they have been an uncommon sight at the heart of the Federation. This has changed over the last three years, when many of the Saber class have been relocated near the core as part of Starfleets build-up of forces against the Dominion. Sabers featured heavily during the recent Borg incursion, where many of the ships involved in the Typhon and Earth battles were destroyed or severely damaged.